The poor Italian peasant boy Francesco already has visions of Jesus and Mary as a child, but the Devil visits him too. He, Francesco, is quite certain that he will become a priest. 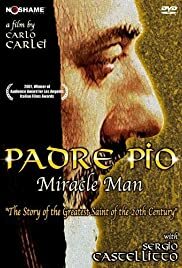 After entering the Capuchin Order it becomes clear that Padre Pio (his new name) has powers which can not be explained rationally: he heals the sick, knows the names, problems and future of complete strangers.